They've had some tense words in the past. President Donald Trump's historic meeting with North Korean leader Kim Jong Un is the latest step in what previously had been a tense and combustible public relationship between the two men. North Korea, meanwhile, once promised “thousands-fold” revenge against the U.S. The degree to which Trump and Kim continue to tamper their rhetoric remains to be seen. Here is a detailed timeline showing how the war of words escalated throughout the course of Trump’s transition and administration. Trump tweeted about possible advancements in North Korean technology. "North Korea just stated that it is in the final stages of developing a nuclear weapon capable of reaching parts of the U.S. It won't happen!" he wrote. A statement from North Korea's Foreign Ministry was read on state television before a U.S. aircraft carrier group arrived in the region for a military exercise with South Korea. "The United States' dispatching of its nuclear carrier task group in the waters off the peninsula proves that its reckless moves for invading North Korea have reached a serious phase. If the U.S. dares opt for military action, then North Korea is ready to react to any mode of war desired by the U.S.," the Foreign Ministry said, according to PBS. North Korean Vice Foreign Minister Han Song Ryol said that an "all-out war" would result if the U.S. was "reckless enough to use military means," according to the BBC. "If the U.S. is planning a military attack against us, we will react with a nuclear pre-emptive strike by our own style and method," he said. During a lunch with ambassadors representing the member countries of the United Nations Security Council, Trump touched on how the group's policy toward North Korea needs to change. "The status quo in North Korea is also unacceptable, and the council must be prepared to impose additional and stronger sanctions on North Korean nuclear and ballistic missile programs. This is a real threat to the world, whether we want to talk about it or not. North Korea is a big world problem, and it's a problem we have to finally solve. People have put blindfolds on for decades, and now it's time to solve the problem," he said. Trump tweeted about a North Korean missile launch, "North Korea disrespected the wishes of China & its highly respected President when it launched, though unsuccessfully, a missile today. Bad!" In an interview with CBS, Trump called Kim a "pretty smart cookie" for having taken over after his father's death in 2011. "I can tell you this, and a lot of people don't like when I say it, but he was a young man of 26 or 27 when he took over from his father, when his father died. He's dealing with obviously very tough people," Trump said. "A lot of people, I'm sure, tried to take that power away, whether it was his uncle or anybody else. And he was able to do it," Trump said. "So obviously, he's a pretty smart cookie." Foreign Policy reported that North Korea's Rodong Sinmun newspaper ran an article that made a not-so-veiled threat that New York could be within the range of the country's intercontinental ballistic missiles soon. "The DPRK [Democratic People's Republic of Korea] is about 10,400 kilometers far away from New York. But this is just not a long distance for its strike today," the article read, according to Foreign Policy. "The U.S. is feeling uneasy, as this might be proven in practice. This is because its hostile policy will end in [futility] when the DPRK conducts the test-fire of ICBM capable of precisely striking any place on the U.S. mainland." "Trump blustered early this year that the DPRK's final access to a nuclear weapon that can reach the U.S. mainland will never happen. 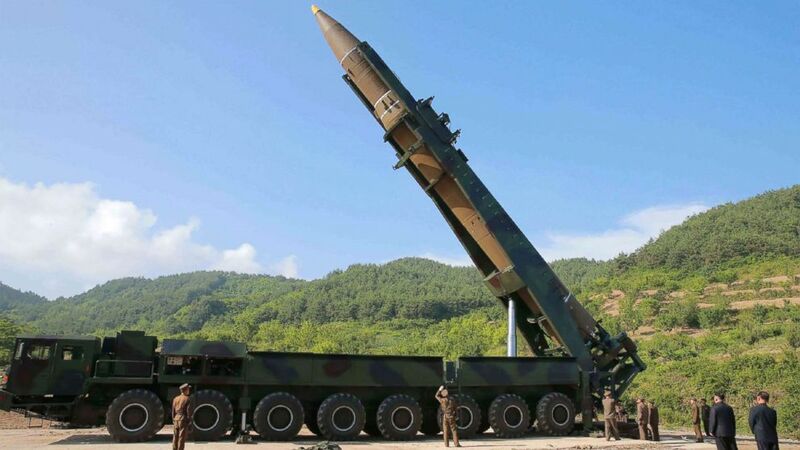 But the strategic weapons tests conducted by the DPRK clearly proved that the time of its ICBM test is not a long way off at all," the North Korean article added, according to Foreign Policy. 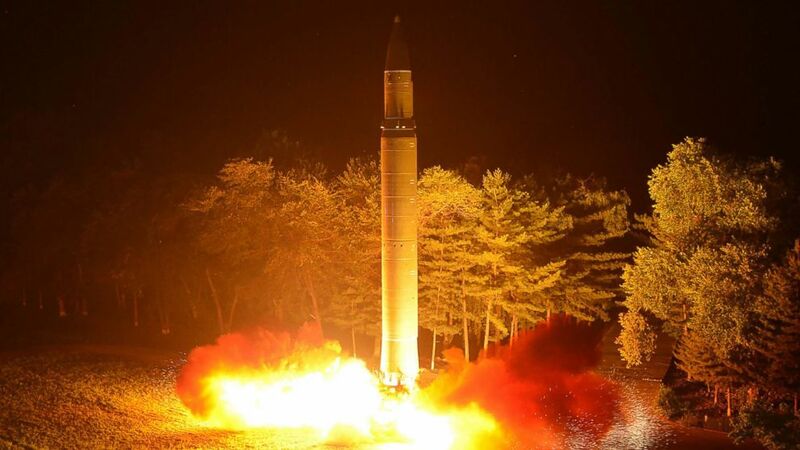 (KCNA via AFP/Getty Images) An image released by North Korea's official Korean Central News Agency on July 29, 2017 shows North Korea's intercontinental ballistic missile, Hwasong-14, being launched at an undisclosed place in North Korea. During a press conference at the White House with South Korea's President Moon Jae-in, Trump said, "The years of strategic patience with the North Korean regime has failed. Many years and they failed. It's failed. And frankly, that patience is over." "Together we are facing the threat of the reckless and brutal regime in North Korea. The nuclear and ballistic missile programs of that regime require a determined response. The North Korean dictatorship has no regard for the safety and security of its people or its neighbors and has no respect for human life. And that's been proven over and over again," he said. Trump blasted North Korea on Twitter in response to its decision to launch a missile strike that day. (KCNA via AFP/Getty Images) This picture released on July 4, 2017 by North Korea's official Korean Central News Agency shows North Korean leader Kim Jong-Un inspecting a Hwasong-14 at an undisclosed location. "North Korea has just launched another missile. Does this guy have anything better to do with his life? Hard to believe that South Korea and Japan will put up with this much longer. Perhaps China will put a heavy move on North Korea and end this nonsense once and for all!" North Korea said in a statement that it would take "thousands-fold" revenge against the United States in response to the latest round of international sanctions over its nuclear program. The statement came through a state-run media outlet, the Korean Central News Agency, two days after the U.N. Security Council unanimously approved sanctions to penalize the regime for its escalating nuclear program and missile launches. North Korea slammed the penalties — which could slash the country's $3 billion in export revenue by a third — as a "violent infringement of its sovereignty" and part of a "heinous U.S. plot to isolate and stifle" the country. The sanctions ban North Korea exports of coal, iron, lead and seafood products, estimated to be worth $1 billion a year. But North Korea asserted the punishment will not lead it to change course. "It's a wild idea to think the DPRK will be shaken and change its position due to this kind of new sanctions formulated by hostile forces," the government said in its statement. (Evan Vucci/AP Photo) President Donald Trump while making comments about North Korea, Aug. 8, 2017, at Trump National Golf Club in Bedminster, N.J.
Trump warned North Korea against making any further threats against the U.S.
"North Korea best not make any more threats to the United States. They will be met with fire and fury like the world has never seen. He has been very threatening — beyond a normal statement — and as I said, they will be met with fire, fury and, frankly, power the likes of which the world has never seen before," Trump said, referring to North Korea's statement about taking revenge. North Korea threatened to strike the U.S. territory of Guam in a statement distributed by its state-run news agency. The statement said that the North Korean military is reviewing a plan to create an "enveloping fire" around Guam, in the Pacific Ocean about 2,100 miles from North Korea. Later that day, Secretary of State Rex Tillerson, in Guam for a refueling stop on his way back to the U.S. from a regional summit in the Philippines, dismissed North Korea's rhetoric about attacking the island. "I do not believe that there is any imminent threat," he said. "Americans should sleep well at night." In the statement released by the Department of Defense, Mattis didn't mince words, cautioning North Korea that its actions "will continue to be grossly overmatched by ours and [it] would lose any arms race or conflict it initiates." He added that Kim should "take heed" of the U.N. Security Council's "unified voice," referring to the sanctions issued against the nation, and called for the country to "cease any consideration of actions that would lead to the end of its regime and the destruction of its people." 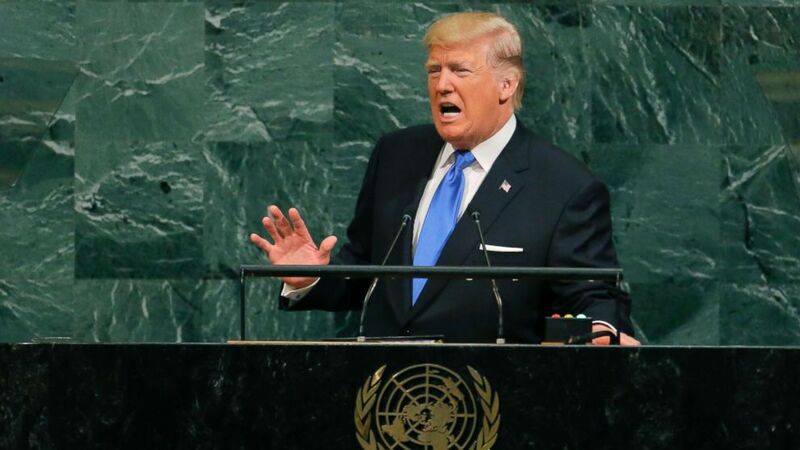 Trump opted not to use the North Korean's name while making his first address to the United Nations, using a new nickname instead: "Rocket Man." (Lucas Jackson/Reuters) President Donald Trump addresses the 72nd United Nations General Assembly at U.N. headquarters in New York, Sept. 19, 2017. At first, Trump did not name the North Korean leader, using a nickname instead. Trump said, "No nation on earth has an interest in seeing this band of criminals arm itself with nuclear weapons and missiles. The United States has great strength and patience, but if it is forced to defend itself or its allies, we will have no choice but to totally destroy North Korea. Rocket Man is on a suicide mission for himself and for his regime. The United States is ready, willing and able, but hopefully, this will not be necessary." He called on all nations to isolate the Kim regime in light of its "reckless pursuit" of nuclear weapons and treatment of its citizens. He also said it was "an outrage" that some nations continue to trade with North Korea. At other points, he referred to Kim's regime as "depraved" and "twisted." The North Korean ambassador to the United Nations, Ja Song Nam, was photographed at the General Assembly that morning, but he left before Trump entered the room. The seats assigned to North Korea, which are in the front row, were empty during Trump's speech. The only individual in the area was an unidentified man who appeared to be taking notes. 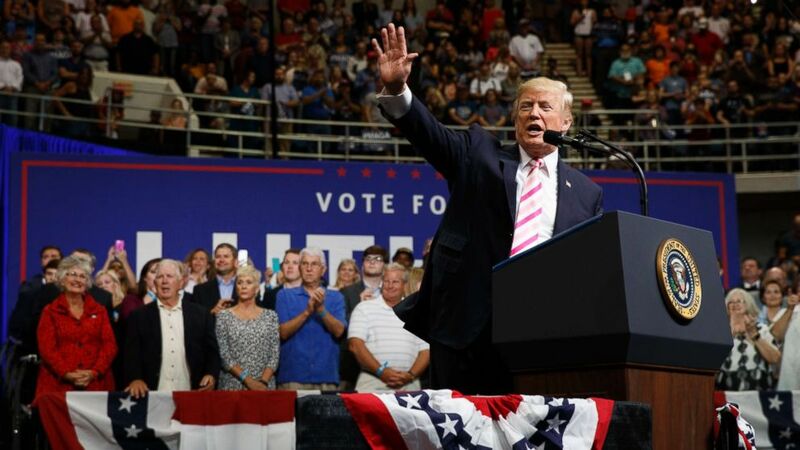 Trump used the nickname again during a riff on North Korea at a rally for then-Republican Senate candidate Luther Strange in Alabama. (Evan Vucci/AP) President Donald Trump speaks during a campaign rally for Senate candidate Luther Strange, Sept. 22, 2017, in Huntsville, Ala.
"We can't have madmen out there shooting rockets all over the place. And by the way, 'Rocket Man' should have been handled a long time ago," Trump said. "Maybe something gets worked out and maybe it doesn't. Personally, I'm not sure that it will," Trump said. Trump seemed less optimistic about the chances of an effective negotiation days later, however, telling Secretary of State Rex Tillerson via tweet that he was "wasting his time." "I told Rex Tillerson, our wonderful Secretary of State, that he is wasting his time trying to negotiate with Little Rocket Man...Save your energy Rex, we'll do what has to be done!" Trump wrote in two tweets. "Being nice to Rocket Man hasn't worked in 25 years, why would it work now? Clinton failed, Bush failed, and Obama failed. I won't fail," he wrote in a later tweet that day. Trump made a multi-stop, two-week visit to Asia and during his visit to South Korea, he addressed the country's National Assembly. (Chung Sung-Jun/Getty Images) President Donald Trump gestures as he speaks at the National Assembly on November 8, 2017 in Seoul, South Korea. Trump is in South Korea as a part of his Asian tour. "I hope I speak not only for our countries but for all civilized nations when I say to the North, do not underestimate us and do not try us," Trump said. The speech and the Asia trip overall came during a time of extended silence on the missile-testing-front. Nov. 9 marked the longest stretch of time -- 56 days -- since Trump took office that the North Korean regime has not conducted a test. North Korea later responded to Trump's speech, saying the speech was made up of "reckless remarks by an old lunatic." And Trump responded with a tweet, appearing to soften his stance. "Why would Kim Jong-un insult me by calling me 'old,' when I would NEVER call him 'short and fat?' Oh well, I try so hard to be his friend - and maybe someday that will happen!" Trump wrote. When asked about the tweet later that day, Trump acknowledged it would be surprising for them to suddenly become friends. "I think anything is a possibility. Strange things happen in life, that might be a strange thing to happen, but it's certainly a possibility," Trump said, adding, "if that did happen, it would be a good thing." After a stretch of relatively little change on the topic, Trump turned to Twitter to tout what he saw as the effectiveness of sanctions against the regime. "Sanctions and “other” pressures are beginning to have a big impact on North Korea. Soldiers are dangerously fleeing to South Korea. Rocket man now wants to talk to South Korea for first time. Perhaps that is good news, perhaps not - we will see!" Trump tweeted. North Korea came up in Trump's first State of the Union address, warning that the country's "reckless pursuit of nuclear missiles could very soon threaten our homeland." "We need only look at the depraved character of the North Korean regime to understand the nature of the nuclear threat it could pose to America and our allies," Trump said in the speech. The parents of American student Otto Warmbier, who died shortly after being returned to the U.S. from North Korean captivity, attended as special guests of the White House, as was Ji Seong-ho, a man who escaped hardship and torture in North Korea as a boy. 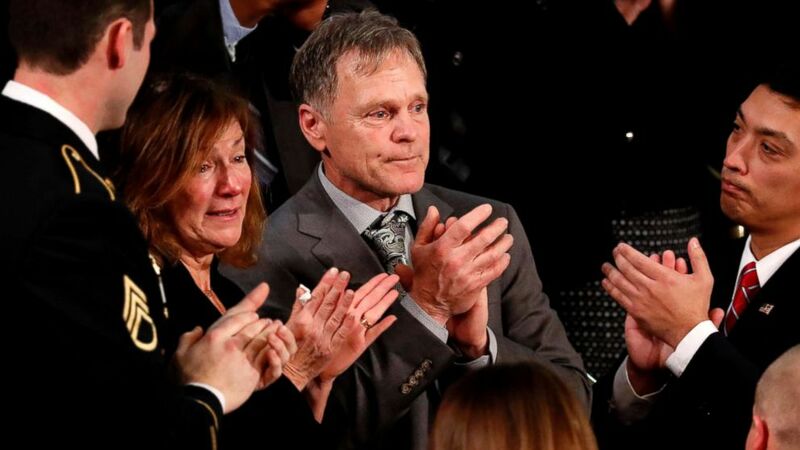 (Jonathan Ernst/Reuters) American student Otto Warmbier's parents Fred and Cindy Warmbier applaud as President Donald Trump talks about the death of their son Otto after his arrest in North Korea during the State of the Union address to a joint session of the U.S. Congress on Capitol Hill in Washington, D.C., Jan. 30, 2018. In the wake of the State of the Union, Trump met with other North Korean defectors in the White House, praising the "special group of people." "These are just great people that have suffered incredibly. There are many, many others like them that have suffered so much," Trump said. This particular instance relates not to something that was said but instead to something that went unsaid. Vice President Mike Pence was originally slated to hold a secret meeting with North Korean officials while they both were in South Korea for the Olympics opening ceremony but the meeting was reportedly nixed at the last minute. 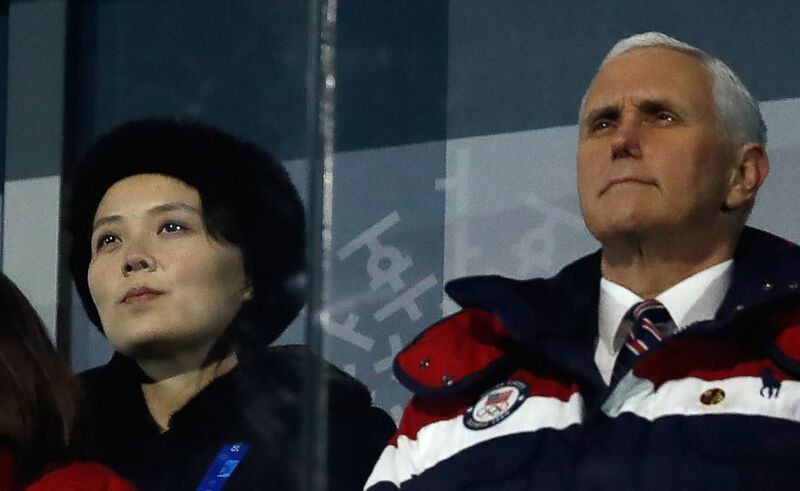 (Odd Andersen/AFP/Getty Images) Vice President Mike Pence, right, and North Korea's Kim Yo-Jong, the sister to North Korea's leader, Kim Jong-Un, attend the opening ceremony of the Pyeongchang 2018 Winter Olympic Games, Feb. 9, 2018. In a statement, Nick Ayers, Pence's chief of staff, said, “North Korea dangled a meeting in hopes of the Vice President softening his message, which would have ceded the world stage for their propaganda during the Olympics," adding Pence would have confronted the North Koreans about human rights abuses and their nuclear weapons ambitions. During his address to the Conservative Political Action Conference, Trump suggested that he was optimistic about change as motivated by sanctions. 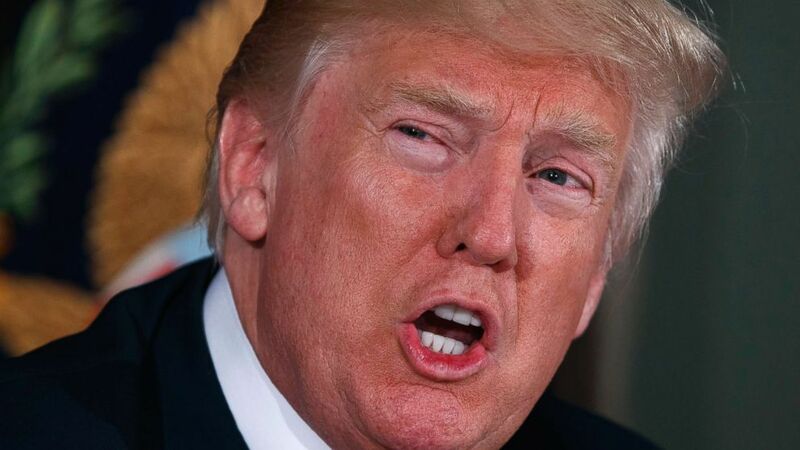 "I do want to say, because people have asked — North Korea — we imposed today the heaviest sanctions ever imposed on a country before," Trump said. "And frankly, hopefully something positive can happen. We will see. But hopefully something positive can happen. But that just was announced, and I wanted to let you know. We have imposed the heaviest sanctions ever imposed." Days before a historic announcement about a significant change, Trump hinted that things between the two countries were allegedly headed in a positive direction. "Possible progress being made in talks with North Korea. For the first time in many years, a serious effort is being made by all parties concerned. The World is watching and waiting! May be false hope, but the U.S. is ready to go hard in either direction!" Trump tweeted. 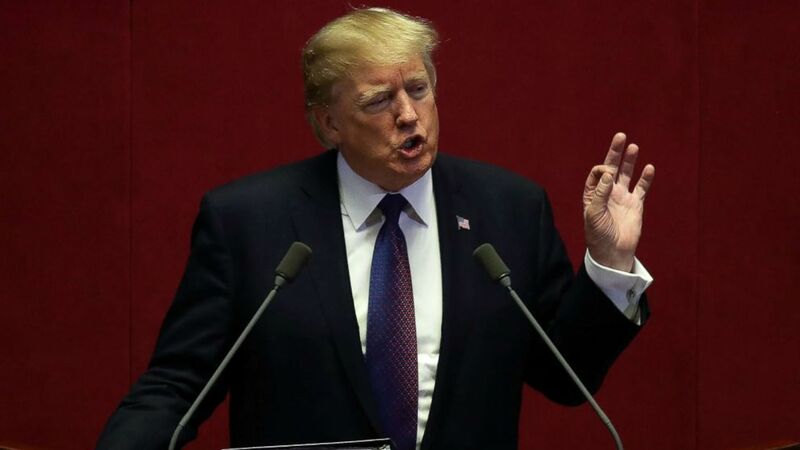 It was announced that Trump agreed to a high-stakes meeting with North Korean leader Kim Jong Un by this May on his nuclear weapons program, South Korea's national security adviser announced at the White House Thursday evening. He had briefed the president on a message from Kim earlier in the day. The White House said afterward that Trump "will accept the invitation," and Trump tweeted about the progress in the relationship. "Kim Jong Un talked about denuclearization with the South Korean Representatives, not just a freeze. Also, no missile testing by North Korea during this period of time. Great progress being made but sanctions will remain until an agreement is reached. Meeting being planned!" Trump tweeted.